Persol glasses rank among those with a record of popularity that reaches back for almost one hundred years. The eyeglasses are truly classic. 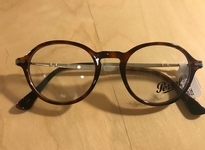 Persol eyeglasses are known for quality in materials and manufacture with stylized metal hinges at the temple make them unique and easily recognizable and enduring. Back in 1917 in Turin, Italy, Giuseppe Ratti was the owner of Berry Opticians, and he began the great adventure which had destiny written all over it. He began by making technologically advanced glasses, specifically for the needs of airplane pilots and fast-car drivers who required a high quality vision, as well as protection from the elements and vicissitudes of the inclemencies of the weather. The first model in 1957 was named “649”, and it was designed for the Turin tram drivers because they needed glasses large enough to protect their eyes against both the sun and the air and dust. The design of this first effort was so novel, that it became an instant success, and was copied for a long time by a succession of imitators. But these sunglasses became truly immortalized in 1961 when Marcello Mastroianni donned them in his feature film “Divorce Italian Style”. Technological innovation became the hallmark of the Persol brand in the 1980s, which continued to garner significant attention to the brand. The lenses and frames were tested in several extreme environments, including the desert, and in high altitudes. In the early 1990s Persol?s female image was entrusted to Italian actress Ornella Muti, for whom Persol purposely created a pair of incredibly popular glasses (the elegant 830 model), and then in 1993-94 with super model, Carol Alt. She too was dedicated a personalised model (the Carol 853 model).